Alyssa Garcia at the plate. Garcia and the Bulldogs host Ball State on April 18. Jimmy Lafakis/Collegian file photo. 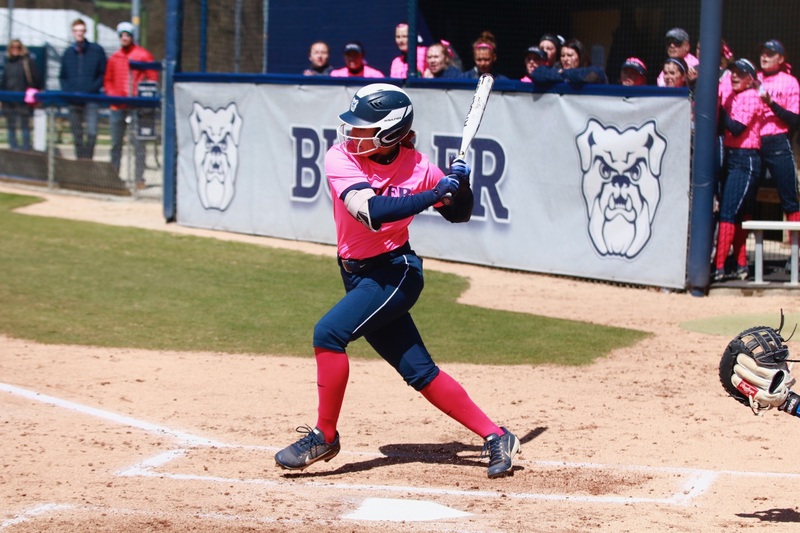 The Butler University softball team will take a break from Big East play with a home nonconference matchup against Ball State University on April 18. First pitch is slated for 4 p.m at the Butler softball field, and the game will stream on the Butler Bulldogs Facebook page. The Bulldogs enter the game with a 5-4 Big East record and 15-21 overall mark following a 2-1 performance in a weekend series at Georgetown University. After falling in the first game of the weekend, Butler rallied for back-to-back come-from-behind victories in the final two games. Sophomore first baseman Madi Christiansen homered in extra innings to give the team their first win, while a five-RBI weekend from sophomore outfielder Payton Longest landed her on the Big East softball weekly honor roll. Offensively, junior outfielder Jenna Foreman, junior pitcher/infielder Kaitlin Doud and senior infielder Alyssa Lach have led the way for the Bulldogs this season. Foreman is third in the Big East with a .393 batting average and second in the conference in hits with 48. Her 30 stolen bases also lead the Big East. Doud leads Butler with five home runs and 23 RBIs, and her five triples are top in the conference. She is also second on the team in both ERA and innings pitched. Lach, meanwhile, has been the team’s most consistent infielder. She is hitting .295 and is second on the team in runs, home runs and RBIs while appearing primarily at third base. On the mound, Alyssa Graves has emerged as the team’s best pitcher. The freshman is tied for the conference lead with a 2.01 ERA and has seven complete games to her credit. Last season, the Bulldogs fell to Cardinals in both of their two matchups, 7-1 and 10-2. The teams’ matchup this season was rescheduled to mid-April following a March 21 weather postponement.